A good CPU for gaming, and for maintaining the status quo. The i5-7600K isn't substantially different from the i5-6600K, but if you're in the market for a new gaming CPU, it's the best overall value. Improves clock speeds by 300MHz over Skylake. Good thermals, power, and overclocking. Only slightly faster than Skylake. Kaby Lake processors, aka 7th Generation Core, are Intel's new hotness, with plenty of marketing muscle to back them up. Are the new parts a must-have upgrade, though? The simple answer is no, particularly when it comes to desktop users. As the 'Optimization' phase of Intel's Process-Architecture-Optimization paradigm, we didn't expect otherwise. Kaby Lake uses a refined 14nm process to improve clock speeds without noticeably altering the power requirements of Skylake, and gets a few additions (HEVC 4K decode/encode support) that will mostly benefit mobile users. Our main Kaby Lake hub includes additional charts comparing stock performance, plus additional architectural details. Our Kaby Lake overclocking article does the same for all tested CPUs at overclocked settings. The Core i5-7600K is mostly a lateral move for the Core i5 series of processors, with a slight upward trend in performance—exactly the same approach Intel has taken since the Core i5-2500K. There's also a new platform that increases the number of PCH chipset lanes to 24, but raw performance should scale directly in proportion to clock speed. Compared to the i5-6600K, clock speed on the i5-7600K is eight percent higher (give or take half a percent). The good news is that, at least in markets where the i5-7600K is readily available, it effectively replaces the i5-6600K at the same price. And make no mistake, the i5-7600K is a better (ie, faster) processor than the i5-6600K—it's just not a revolution in CPU performance. If you upgraded to a Core i5/i7 desktop part from the Haswell / 4th Gen Core period or later, you can sit out this round, and if you're primarily worried about gaming performance, that advice applies even more. Compared with other processors, the i5-7600K may place below the midpoint of many of the charts, but that's largely because the charts include a collection of high-end parts. For lighter work, the difference between most of the Intel parts is negligible. If you're mostly doing office work, surfing the Internet, and playing games, Core i5 is the sweet spot in bang for the buck. The other way of looking at the CPU performance charts is that if you are doing CPU intensive work, like video editing, there's definitely a benefit in moving to Core i7 over Core i5, and potentially even greater gains if you move to the X99 platform. For workloads that scale well with core count, even running at stock clocks the Haswell-E and Broadwell-E parts are potent. The Core i7-7700K is typically 40-50 percent faster than the i5-7600K in CPU heavy work, and the i7-6900K is sometimes more than twice as fast. Overclocking helps some, but the 7600K sample I tested wasn't quite stable at 5.0GHz and I had to drop to 4.9GHz. I've seen other reports of 5.0 to 5.2GHz, but bear in mind that overclocking is never guaranteed. I suspect my sample is about as low as i5-7600K will reach with liquid cooling, and if you're adventurous enough to delid and use a higher quality TIM (Thermal Interface Material), you should be able to drop temperatures and eke out another 100-200MHz. But even with overclocking, the 7600K can't quite catch the i7-6700K or i7-7700K. Compared to the previous generation, the i5-7600K is eight percent faster than the i5-6600K, exactly the difference in clock speed. But what about older CPUs like the i5-4670K, i5-3570K, and i5-2500K? I don't have full test results so instead I researched the question. i5-7600K is ~8 percent faster than i5-6600K, which is ~12 percent faster than i5-4670K; the 4670K is ~9 percent faster than i5-3570K, which is ~8 percent faster than i5-2500K. That's in CPU intensive (non-gaming) workloads, so combined the Kaby Lake i5-7600K is a bit more than 40 percent faster than an old i5-2500K—assuming all chips are running stock; overclocking would narrow the gap slightly. I ran some benchmarks showing gaming performance on Kaby Lake, and while those results use the i7-7700K, dropping down to the i5-7600K doesn't make any significant difference. I won't repeat the charts here, but the HD Graphics 630 is the bottleneck when it comes to gaming performance. Gamers will definitely want a discrete graphics card. If the difference in raw CPU performance isn't particularly noteworthy, the gaming potential of the i5-7600K is even less so. It's not that CPU performance doesn't matter for games, but it's a far less important aspect than graphics performance. Even with a GTX 1080, most of the fastest CPUs are within a few percent of each other on the CPUs I tested. Overall, the i5-7600K is less than one percent faster than the i5-6600K in games. Overclocking improves average gaming performance by another 1.6 percent over stock, but anything less than five percent is practically meaningless. More importantly, everything from the i5-6600K through the i7-7700K is effectively tied for gaming potential using one of the fastest graphics cards available. There are slightly more noticeable individual differences in games, of course. Ashes of the Singularity, Civilization VI, and Hitman all show more than a 10 percent improvement in performance going from a 6600K to a 7600K. But with fourteen demanding games tested, more than half show less than a one percent change in performance. It's why we routinely point to the Core i5 unlocked CPUs as the best overall gaming processors—they're 97 percent of the performance of the Core i7 offerings, at two thirds the cost. As above, I also researched gaming performance with the various Core i5 processors dating back to the i5-2500K. There's a wider margin of error, but on average the i5-7600K is ~1 percent faster than i5-6600K. That chip is ~5 percent faster than the i5-4670K, which is ~4 percent faster than i5-3570K, and IVB is ~4 percent faster than i5-2500K. Combined, i5-7600K is about 15 percent faster for gaming than the i5-2500K. Much of this depends on the games tested and the GPU used, so there are instances where the gap is smaller or larger, but the difference in gaming performance shouldn't be greater than the CPU gap (around 30 percent, see above). Ivy Bridge and Sandy Bridge are becoming a potential bottleneck in games, particularly with high-end GPUs like the GTX 1070/1080, but if you're running more modest hardware like a GTX 970 or R9 390, the performance loss will typically be less than 10 percent. Intel's Core i5 series, particularly the unlocked K-series chips, have been the go-to solution for gamers since they first started showing up. It's easy to see why, as the additional logical cores offered by Hyper-Threading aren't critical for games, and overclocking means you can erase any clock speed deficit. Running at 5GHz, give or take, the i5-7600K can handle anything you might throw at it. But then, I said the same about the i5-6600K, and other than 200-300MHz nothing has really changed. There are several reasons for the lack of major changes. First, making significant improvements to CPU architectures is really difficult—all the easy fixes and tweaks are gone. Even if you double the number of transistors in a chip, you might only realize a 15-25 percent improvement in average performance. This is very different from the world of graphics chips, where doubling transistor count can come very close to doubling performance. Second, there hasn't been any serious competition from AMD (or anyone else) for at least five years. Third, a growing number of users don't feel a need to upgrade—and plenty more do a lot of their email and office work on smartphones and tablets. And finally, like all big corporations, Intel wants to make a profit. It must be terrifying to be Intel, looking at the number of users sitting on CPUs from five or more years back and wondering what can be done to convince them to upgrade—and to do it again in three or four years. The business model Intel used for decades is fading away, and performance needs for the masses have hit a plateau so large that the edges fade into a haze. Needless to say, Kaby Lake isn't changing any of this. If you're starting from a clean slate and building a new PC today, the Core i5-7600K is a great chip. It's faster than the previous generation and not really any more expensive (though that can vary by geographic location). 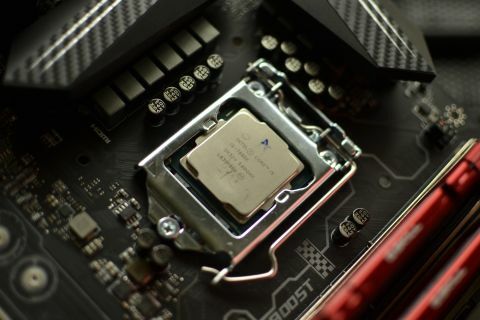 It takes over our current recommendation for the best gaming CPU from the i5-6600K. But the use of the word 'current' is important, as AMD's Ryzen is just around the corner. We still don't know exactly what to expect from AMD in terms of pricing and performance, but the 8-core Ryzen parts are rumored to cost far less than Intel's 8-core i7-6900K—I've seen estimates of anywhere from $300 to $500. That's more than i5-7600K, but 4-core Ryzen parts are likely to go head-to-head with Core i5. Single-threaded performance will likely belong to Intel's Skylake and Kaby Lake, thanks to clock speeds and architectural advantages, but indications are Ryzen will be very similar to Haswell/Broadwell-E in per-core performance. Depending on pricing and clock speeds, that means 4-core or 6-core Ryzen models could be a better solution once they launch, which should be some time in the next six weeks. Overall, Core i5-7600K is a good processor, but to get the most out of it you'd need to be upgrading from something in the Sandy Bridge or Ivy Bridge era. And if you're running one of those processors and didn't jump on Skylake 18 months ago, Kaby Lake is only slightly better. My upgrade advice is to always wait until your current system is no longer doing its job—whether it's too slow, or unstable, or whatever. For graphics cards, you can typically skip every other generation of new GPUs, but with CPUs you can often skip three or four generations without feeling left behind. Frankly, we've been spoiled in the world of PC hardware, where a moderate 5-10 percent improvement is greeted with scorn. If cars improved by 10 percent every year or so, I'd be ecstatic. That plays into how I rate the i5-7600K. I wish Intel would have done more, but improving performance each generation is becoming increasingly difficult. Kaby Lake still progress shows progress relative to Skylake, albeit only in moderation. Short of some fundamental change in the way we use and manufacture processors, though, that's basically what we should expect. For now, I recommend you wait and see what AMD has to offer with Ryzen. There's always something faster coming down the pipeline, but Ryzen is close enough that rushing out to upgrade your CPU, motherboard, and RAM right now doesn't make a lot of sense. Kaby Lake might still be our recommendation in March, or Ryzen may pull off the upset. If nothing else, at least Ryzen will be more exciting in terms of bringing major changes from AMD's previous generation of CPUs.